I tossed out a bag of mushy strawberries this evening, damn! Did you know that the average American wastes 40% of the food they purchase? I haven’t measured my own waste, but 40% doesn’t seem unrealistic. And that’s sad. What’s worse? Much of that wasted food ends up in landfills where it breaks down and forms methane, a greenhouse gas far more powerful than carbon dioxide. This Food Republic infographic might help all of us waste less. 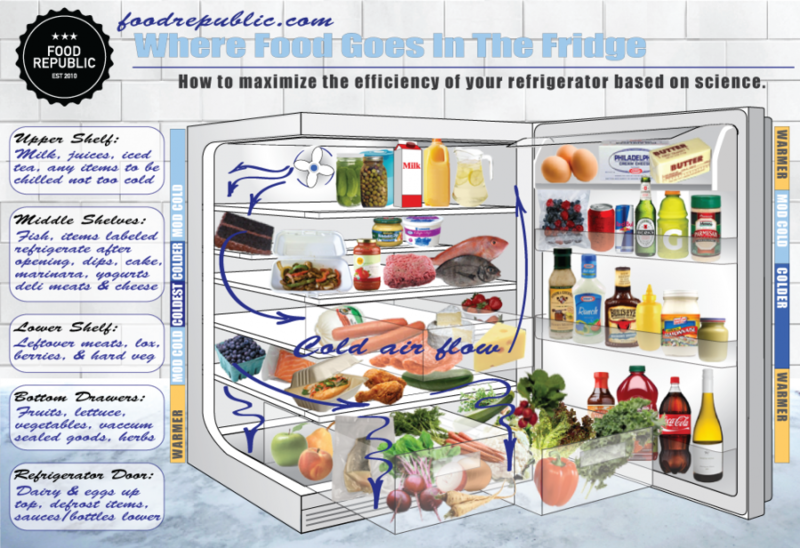 It illustrates where to store different foods in our refrigerators to preserve flavor and minimize waste. Reducing food waste is important. I vow to do my best — right after I clean out my frig. Can’t read the info. Do you have the direct link to the original website? If you click on the image it will enlarge viewable enough to see. Thank you for the info. Greatly appreciate it.